1989 – Aged 24 – It took 8 year’s before I was sent to see a Vascular Specialist at Hull Royal Infirmary. This was the first Dr (Specialist) to say I had Lymphedema. 1989 – 1990 – Aged 24/25 – The Vascular Specialist then sent me to see a Lymphedema Specialist at St. Mary’s Hospital in London. He saw my leg and offered me four operation’s were they cut down the side of my leg at both sides in four stages and scoop out the problem and stitch me back up. I turned this down because it would not cure the problem as my leg would get big again and there was also a chance that I would loose the leg. 1990 – 1991 – Aged 25/26 – I was asked by a Dr/Specialist if I wanted to try an experiment with my leg called Liposuction. I said yes hoping it was going to work. The procedure was done at Kingston General Hospital on Beverly Road, Hull. The procedure was very painful as was the healing process. Was it a success? No, it just made a big delve in my leg and not long after it started to refill back up! 1996 – Aged 31 – Years went by without any help or suggestion what to do about my leg when I came across an article in The Hull Daily Mail about Lymphedema. It stated that there was a new department opening at Princess Royal on Salthouse Road, Hull. I made contact with a Lymphedema Nurse who ran the Lymphedema Clinic. She made an appointment for me to go and see her and discuss about my problem and how to help it. The treatment which she and her colleagues gave me was a Lymphatic Massage followed by heavy tight bandaging which needed to be on every day until my leg reduced enough in size so I could fit into a surgical stocking. Before starting the treatment I was carrying around over 10 litre’s of extra fluid in my Lymphedema leg. 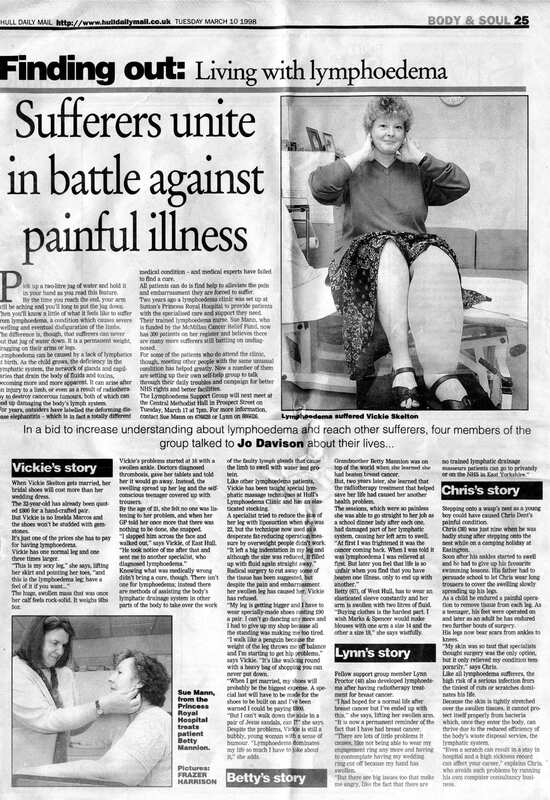 1998 – Aged 32/33 – I appeared in the Hull Daily Mail on behalf of the Lymphedema Clinic to try and make other Lymphedema suffers aware that there is help out there! 2001 (Approx.) – 36 – I stopped going to the Lymphedema Clinic after a while as they were getting over run with Cancer Patients and it was getting too difficult to make an appointment to go and see her. At that time I felt I only had primary Lymphedema and not the secondary type which is caused by cancer related illnesses and I thought they were more in need of help then me! 2006 (Approx.) – Lymphedema Clinic at Princess Royal on Salthouse Road, Hull closed down! So now there was no help available for Primary Lymphedema sufferers.